When most people think about the biggest threats to the U.S. economy they usually mention things like the budget deficit, the national debt or the trade gap. What rarely gets mentioned as a potential economy killer is something we all have to face every day yet mainstream economists refuse to acknowledge it. The biggest problem in the economy isn't the excessive amount of public or private debt; it's the extremely high level of prices for basic commodities like food and fuel. Economists consistently underestimate how much of the middle class worker's paycheck goes to buying these two essential needs. For all of its successes, the Fed's QE program did nothing to alleviate high retail food and fuel prices. If anything, it may have actually increased them. Consider that during the Great Recession while stock and commodity prices were falling along with interest rates, retail food prices barely fell at all. This was partly due to the "stickiness" of retail prices but also to the fact that the cleansing effects of deflation were never allowed to completely wash through the economy. The Treasury and the Federal Reserve immediately set to work in providing abundant stimulus money in order to boos tprices and prevent deflation from working its magic. 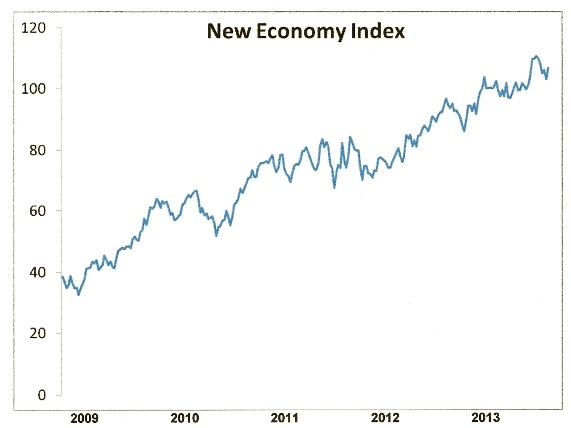 As the following graph of the New Economy Index (NEI) shows, they were wildly successful in this endeavor. In boosting asset prices, the Fed also created a spillover effect which increased the already high retail price level. Diesel prices, which have a profound impact on the prices of a wide range of retail goods, rose to extremely high levels and took a bite into consumers' paychecks. Added to the higher prices the middle class was forced to absorb was a muted housing market correction. Although home prices declined during 2007-2011, they found a bottom at a much higher level than would have been the case had deflation been allowed to completely run its course. In its relentless fight against deflation, the Fed has set the stage for even higher retail prices once the 120-year cycle bottoms next year. Ironically, it might just be inflation that destroys all the Fed's efforts at defeating deflation after 2014. This would come as no surprise to Fed historians: central banks are notorious for fighting yesterday's war. True inflation, however, is still a ways off. Right now the deflationary under currents of the 120-year cycle still threaten global economic stability for at least one more year. The Fed has apparently concluded that its anti-deflationary stimulus measures have succeeded in healing the economy. The bank is therefore considering scaling back its monthly asset purchases, possibly as soon as this fall. As we talked about in a previous report, the mere hint of the Fed "tapering" has essentially created a tight money situation in the bond market as investors have dumped Treasuries and municipal bond in anticipation of higher rates. In doing so they've created a self-fulfilling prophecy of higher rates which is already being felt in the mortgage lending and real estate sector. Economists are lining up to put a bullish spin on the rising rates. Many contend that rising rates reflect a strengthening economy. While this may be true in normal circumstances, it's not the case here. Rates only started rising after it was hinted that the Fed might scale back its asset purchases, which in effect created a quasi-tight money situation. In other words, investors began acting on the assumption that a tighter Fed monetary policy will soon become a reality - by dumping bonds - which in turn led to higher rates. This action doesn't reflect a strengthening economy; rather, it shows that investors realized the days of the Fed-assisted bond bull market were numbered. Needless to say that the repercussion of a tighter money policy on the economy won't be pretty in 2014 when the deflationary super cycle enter its final "hard down" phase. On the score of a QE tapering, the economists at Kiplinger believe the Fed will start phasing out bond purchases in December. Chairman Bernanke's term ends in January, and Fed watchers increasingly see the hawkish Larry Summers as his replacement. Some Fed watchers also believe the Fed could maintain its purchase of mortgage-backed securities even after it slows its Treasury purchases in a bid to supporting the housing market. Regardless of how it turns out, the Fed is clearly heading in the direction of diminishing the scale of its asset purchases. This strategy, if pursued,will run counter to the deflationary headwinds that will be increasing on a monthly basis starting in 2014. The matter at hand right now is the selling pressure gold and silver have encountered lately. In last week's commentary we examined the potentially bearish (from a contrarian standpoint) development of investment bankers becoming overly optimistic on gold. 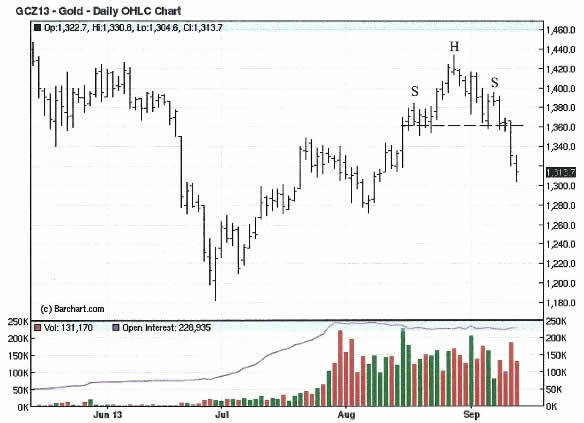 Additionally, there was a bearish "head and shoulders" pattern in the daily chart for December gold. Technical analysis suggested that a break below the pivotal $1,360 level would put the sellers firmly in control, and this is what happened on Thursday as early selling pressure resulted in a breakdown below $1,360 and a quick drop to the session low of $1,320. Now that the bears have regained control of the market, we must assume the path of least resistance is currently down for the metals in the immediate-term. As if the daily chart for gold weren't ominous enough, the market received a major psychological blow on Wednesday in the form of a research report from a major institution. Goldman Sachs Group Inc., in a Sept. 11 report, said it expects the gold price decline to extend into 2014. Goldman analysts Jeffrey Currie and Damien Courvalin said they expect that a reduction of Fed asset purchases will weigh on gold prices going forward. The analysts expect the Fed will curb quantitative easing at the upcoming September policy meeting, the report said. "Gold prices will decline into 2014 on the back of an acceleration in U.S. activity and a less accommodative monetary- policystance," the analysts wrote as reported in Mineweb on Sept. 11. "The September FOMC meeting, where our economists expect a tapering of QE3, could prove the catalyst to push gold prices lower." Keeping in mind that Goldman is a major market-moving force in the commodities market, the investment bank's latest pronouncement on the metal is likely to have a negative psychological effectfor investors. Indeed, Goldman's latest report preceded Thursday's 3% drop and may have served as a catalyst for the breakdown below the $1,360 "neckline" in the December futures contract. Goldman's Currie has been spot on with his gold predictions this year and his calls on the metal carry increasing weight. This is another psychological barrier that has tripped up the bulls and given the bears an excuse at taking control once again. Traders often ask what is the single best strategy to use for selecting stocks in bull and bear markets? Hands down, the best all-around strategy is a relative strength approach. With relative strength you can be assured that you're buying (or selling, depending on the market climate) the stocks that insiders are trading in. The powerful tool of relative strength allows you to see which stocks and ETFs the "smart money" pros are buying and selling before they make their next major move. Order today to receive your autographed copy along with a free booklet on the best strategies for momentum trading. Also receive a FREE 1-month trial subscription to the Gold & Silver Stock Report newsletter.